As I predicted years ago, technology continues to influence our lives in many ways. We are living in the modern age, and the proof is in the technology that surrounds us and makes us human: From phones to computers to the most sophisticated instruments, whether you’re looking inside your body or beyond the stars, you can’t do anything without technology. Technology keeps pace with the fastest changes in our nonstop world, and that’s what makes it great. And when Silicon Valley heat meets New York City cool — when the bad boys work with the smart guys — it’s explosive. That’s when technology really shines and we get all. The. Feels. And. All. The. Greatest. Technology. 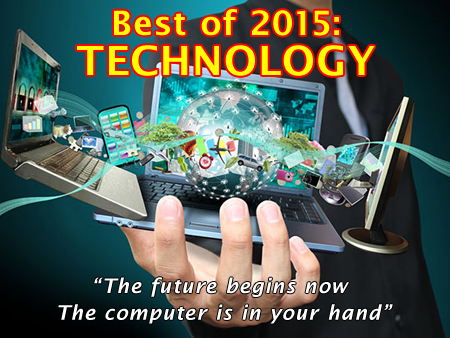 And when it comes to technology, 2015 was no different. We’re talking about technology. So let’s have some fun. 1. Going ALL IN on the hottest technology!!! THIS IS NOT A GAME!! !